Crossroads Chem-Dry is one of the best choices for professional carpet & upholstery cleaning in Carmel and the surrounding area. That's because we use our proprietary Hot Carbonating Extraction cleaning process that combines innovative cleaning solutions and industry-leading equipment. Our technicians will deliver a cleaning that’s not only safe for your carpets, rugs and upholstery, but gives you the peace of mind of knowing you have a clean, refreshed home that is healthier for you and your family. We invite you to learn more about the benefits of Crossroads Chem-Dry’s carbonating cleaning process and green-certified solutions that are safe for your kids and pets. We provide our carpet cleaning services to everyone in Carmel and the surrounding areas. Call today for a free quote! Get a Free Quote For Professional Carpet & Upholstery Cleaning in Carmel Today! Industry experts suggest that homeowners clean their carpets every 3-6 months especially homes with kids, pets or if someone in your home has asthmas or allergies. Regular cleaning will not only improve your home's appearance, but it will eliminate germs and allergens, improve your home's indoor air quality and extend the life of your carpeting. We offer professional cleaning services for homes and offices in Carmel and the surrounding areas. These services include carpet and upholstery cleaning, area and Oriental rug cleaning, pet odor and urine removal, and specialty stain removal. 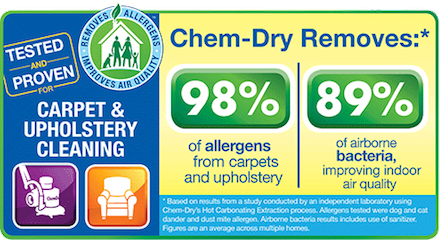 Crossroads Chem-Dry’s cleaning process is better and healthier than other methods for your carpet and upholstery cleaning. Crossroads Chem-Dry’s unique hot carbonating extraction carpet cleaning method uses the power of carbonation to extract more dirt and grime from your carpets, giving them a deeper and longer lasting clean. Our carbonated cleaning solution only requires us to use a fraction of the moisture other methods such as steam cleaning require. This allows your carpets to dry faster, typically in 1-2 hours. Superior carpet & upholstery cleaning services in Carmel!